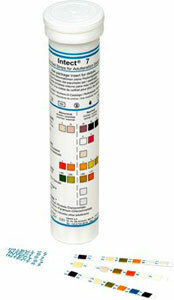 Intect® 7 is designed to detect adulterants in a urine sample. By detecting the levels of creatinine, the presence of nitrite, glutaraldehyde, pH, specific gravity, and of oxidants, including bleach and pyridinium chlorochromate, Intect® 7 determines the integrity of the donor's sample. Intect® 7 is the most effective screen for sample validity testing on the market.